Whether you want the traditional steakhouse experience or something a little different, the Whaling Station has you covered. 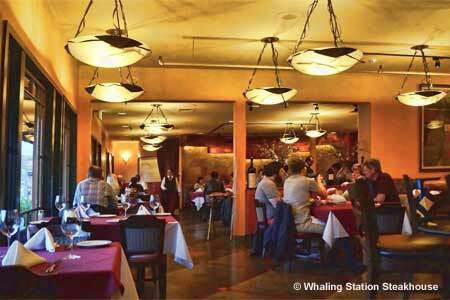 : John Pisto’s sale of this Cannery Row landmark raised eyebrows, but the present owner, a former Whaling Station manager, cleverly brought in veteran Whaling Station chef David Stember. They streamlined the menu while retaining favorites such as a well-seasoned and crusted petite filet, scalloped potatoes and savory creamed spinach. Oysters Rockefeller remains along with the tableside Caesar. Several signature pastas were restored to the menu, too. The bar shakes up old-fashioneds and martinis, while the wine list ranges from affordable California reds to luxe Champagnes. A more wallet-friendly bar menu offers crispy prime rib egg rolls with a sweet chili sauce, a selection of hearty sandwiches, salmon and sand dabs. The crème brûlée is ample for two people, and the Key lime pie is tart and creamy. Whaling Station is still special enough for an anniversary, but it’s now accessible for a Wednesday night out after work.